Ephesians 4:30 instructs us not to grieve the Holy Spirit...but what exactly does this mean? The first consideration is understanding that the Holy Spirit is a person. Jesus, confirms this in John 16:6-8 when He repeatedly refers to the Holy Spirit as "he" and "him". So when we think of grieving the Holy Spirit, we need to approach the idea from a human perspective in order to understand what we can do to offend the Holy Spirit. Since the Holy Spirit is a person, ask yourself how you get offended by others, what do other people do to you to make you sad or distressed? 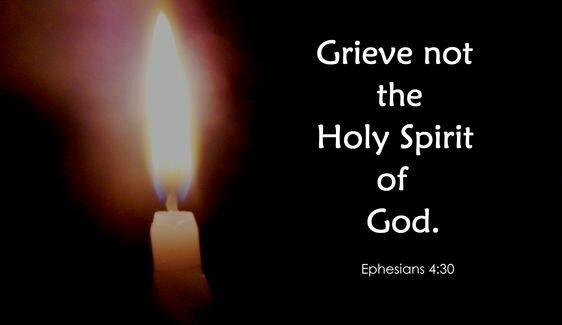 Ignoring or not making you feel unwelcome, talking negatively about you or just completely misunderstanding you are all things that can grieve you and the same applies to the Holy Spirit. Imagine how he must feel in the vast majority of today's churches, who make him feel unwelcome, or worse speak poorly of him when he decides to show up anyway because they don't understand the way he moves, speaks or expresses himself. All these things grieves the Holy Spirit but it goes much deeper than that. The Holy Spirit is God, the part of God who moved before Jesus spoke everything into existence, including you. He considers all of humanity to be his children. If you're a parent, does it grieve you to have two of your children fighting, calling each other names or worse? This is exactly what is referred to in the verses before and after Ephesians 4:30. In verse 29 Paul encourages us to "Let no unwholesome word proceed from your mouth, but only such a word as is good for edification according to the need of the moment, so that it will give grace to those who hear." Again in verse 31 "Let all bitterness and wrath and anger and clamor and slander be put away from you, along with all malice." The Holy Spirit is a personage of God so unselfish he only wants the best for his children including sharing his power with them (us) - but when we argue and fight with each other it grieves him. When we don't welcome him into the church, it grieves him. When we ignore the homeless man on the street it grieves him. Verse 32 sums up how we should treat each other as well as the Holy Spirit - "Be kind to one another, tender-hearted, forgiving each other, just as God in Christ also has forgiven you." Be blessed and be a blessing. God Has a Purpose for You!